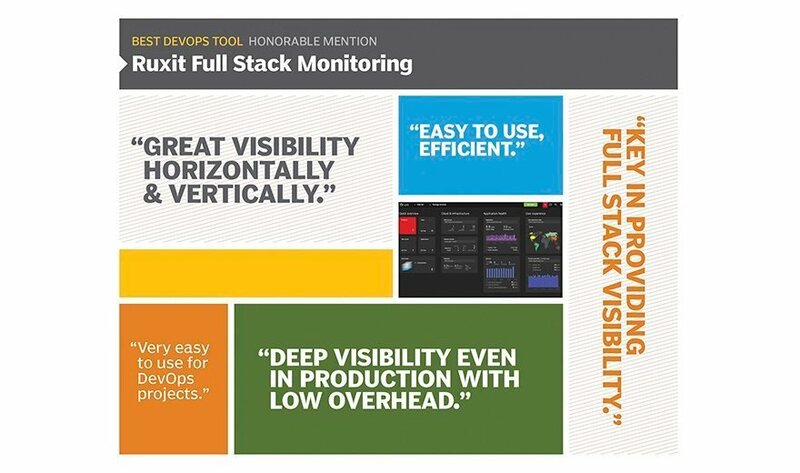 Ruxit, a division of Dynatrace, is a newcomer to the DevOps scene, but Modern Infrastructure readers are very excited about what the infrastructure and application performance monitoring (APM) tool can do for them. Offered as either SaaS or on-premises, Ruxit requires a single agent per host that automatically discovers and baselines the environment. "I chose Ruxit because of its out-of-the-box capacity to monitor system and infrastructure aspects, as well as application performance and user experience," wrote one reader. "[Ruxit] replaced three previous products we were using," said another, "it is simple to use compared to our previous solutions," and has a "gorgeous interface." But the aspect that whets readers appetite for more is Ruxit’s use of artificial intelligence to automatically deliver insight. "I've been blown away by it's auto-discovery, artificial intelligence and deep application knowledge," said one reader. "No other tool provides such insight without any human configuration and input." The idea of DevOps came before the tools specialized for it - I guess no one would argue with that. In this sense, you can - by creating your own and adapting existing tools. But there should be a balance between fitting the context and reinventing of the wheel.